Milk homogenised - 1 lit. Bring milk to boiling temperature. Once it starts to boil add in the lemon juice & allow the whey to separate. Once the fat is separated strain it in a muslin cloth & wait for few min so that all water is strained. If you need a proper shape fold the cloth with the fat in it & rest it something heavy on it to set & allow it for 2 hrs. 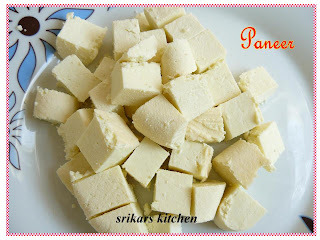 Once the perfect shape is achieved cut it into shapes you wanted & use for any kinda paneer dish. enaku ivlo perfect cubes vandhadhe illa.. urs look so good. I do make this quite often. Yours looks very nice. Wow - you are so clever to do that! I've always wanted to give that a try since I saw it in a book a while back - thank you for sharing. 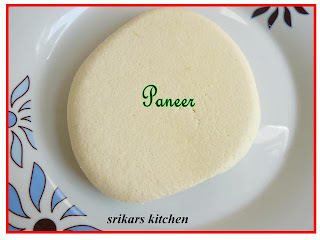 Very lovely, I like making paneer at home. Usually i get it from store only. Never tried this. Yours are perfect.